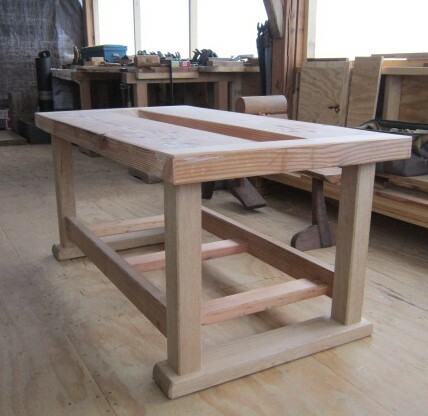 Anyone who wants to involve children in woodworking should consider building a good sturdy low bench to accommodate their work height. I made this workbench for the kid’s workshops I taught at the library this spring. After cutting and fitting all the joinery, I didn’t have time to glue up properly, so instead I let the kids assemble the bench. Then, I knocked it apart and did it again with another group. As adults, we have tables at 28″-30″ and kitchen counters at 36″. Desks and workbenches are in that range of heights. What do kids get? You can’t get a full range of body motion standing on a stool, certainly not to plane boards or cut joinery. Children need a work surface that fits their height. This one is 24″, and seems to work fairly well with the seven-year-olds and older. I can work at it on my knees. This entry was posted in architecture, carpentry, furniture, traditional building, woodworking. Bookmark the permalink.